People looking to buy a home during the Holidays are serious buyers. Serious buyers have fewer houses to choose from during the Holidays, which could lead to an advantage as a seller. Since the supply of listings will dramatically increase in January, buyer’s choices will increase dramatically after the first of the year. Houses show better decorated for the Holidays. Buyers have more time to look for a home during the Holidays than they do during a workweek. Some people must buy before the end of the year for tax implications. January is traditionally the month for employees to begin new jobs. Since transferee’s cannot wait until spring to buy, they have a time consideration they must fulfill. 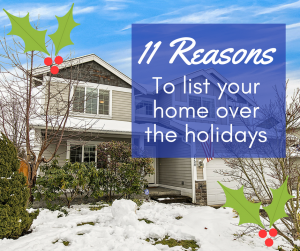 You can still be on the market, but have the option to restrict showings during the six or seven days during the Holidays. You can sell now, you may negotiate a delayed closing or extend occupancy until after the end of the year. By selling now, you may have the opportunity to be a non-contingent buyer during the spring, when many more houses are on the market.